Dump-gate or Brush-gate or Broom-gate. Call it whatever you want, but Richard Hart’s calling out Ben Hebert for dumping on Thursday night has the potential to colour the final should Glenn Howard get past Jeff Stoughton today (which is no sure thing). 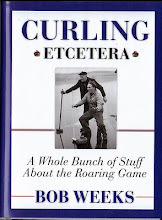 Most folks know that in the ninth end of their round-robin game, Hart accused Hebert of breaking a rule by lifting his broom and leaving debris on the ice to slow down a Martin shot. Hart was hot when he came off the ice, as much at losing as by Hebert’s alleged actions. But I caught up with him before he practiced Friday and he cleared the air. “In no way was I trying to call them cheaters,” he stressed. “I perceived that a rule was broken and I said something about it. Whether that rule was broken or not, that’s not up to me to say. I thought I saw a rule get broken, I asked for them to look at the [replay]. Now despite the fact that Hebert denied dumping, a number of players I talked to said they were happy Hart called Big Ben out. I should point out that when I asked a couple of these players if Hebert was the only one who does this and they said no, but he was the most prominent rule violator. The rulebook says that an official has to make the call and there are three options if the rule is broken. Leave the shot as is, remove the rock from play or replace it where you think it would have finished without the dump. But trust me – no official anywhere is going to make that call, no way, no time. They don’t have the cojones. Hart also said that there will undoubtedly be some uneasy feelings if the two teams meet. He said that he and Howard sat down at breakfast Friday morning and saw Hebert and Martin across the room. They waved. Hebert waved back. That was about it, though. There was a chill in the air. 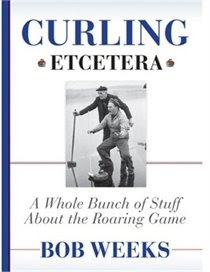 The real problem here is a problem curling has had for some time. You don’t want officials to have the power to affect the game but you want the rules to be enforced. The hog line umpires are a perfect example. 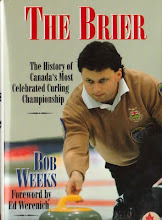 When they were around the players raised bloody hell at the inability of the officials to do that job properly – just ask Randy Ferbey or Paul Savage. Yet they don’t want guys to break the rules by sliding over the hog line. The Eye on the Hog fixed that but I don’t see a solution for dumping. Still, it will be interesting to see what happens if Howard gets past Stoughton today. That should be a good game, likely without any tension.